We examined navigations to the top 3 categories on Black Friday. Based on previous analysis, we learned that Wazers are likely to eat out on Black Friday, so we also looked the most popular times to visit restaurants. The rush to the deals starts early and our data demonstrates that drives to stores actually start the day before Black Friday. In fact, Wazers start shopping around 4 PM on the afternoon of Thanksgiving and drives over the course of the evening were 5 times higher than on a typical night. Crossing our data with Google’s in-store visits (in What Store Traffic Data Reveals About Black Friday Shopping) we can see a similar trend. Use our data to plan the the order of your day and avoid the peak shopping times. When it comes to department stores, an early start Friday morning will be your best option. People tend to shop on Thursday evening to get early deals, and then shopping increases steadily throughout the next day, peaking between 12 and 3pm. When it comes to restaurants, consider grabbing a bite around 2 or 3 pm- beating both the lunch and dinner crowds- and finish up your list in the evening when people are going home. 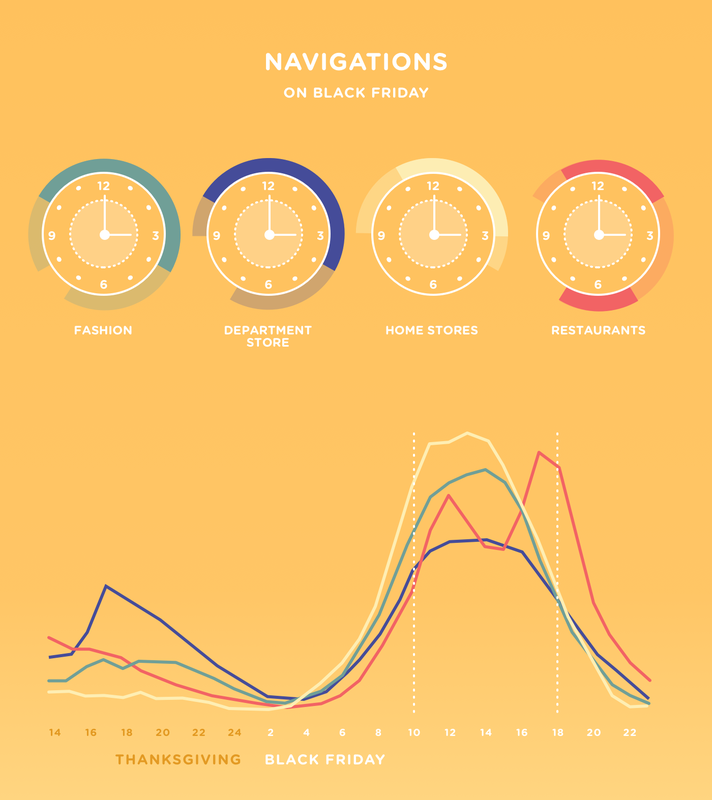 Why Does Mobile Location Marketing Matter on Black Friday? Mobile is taking an increasingly active role in influencing the path to purchase. Based on recent research put out by Google, we know that 76% of people who search for something nearby on their smartphone visit a related business within a day, and 28% of those searches result in a purchase. Brands can capitalize on these mobile moments close to the point-of-purchase, taking the opportunity to capture indecisive shoppers by offering last minute deals and promotions while they are already on-the-go.